Listen, if we're going to accomplish anything of substance in our life, anything that's truly great, we have to have something out in front of us. A vision to compel us and pull us to reaching our highest potential. Alright? That's what it's really all about. Now to have that, we have to have goals. Right? That's what the word is that we use in our lexicon. We need to have a goal out in front of us to really strive for. But the whole field of goal setting, there's a lot of misinformation. A lot of people are kind of disillusioned about it because of failures in the past, or not kind of knowing exactly what to do, or if it really works. Today we're going to go through the definitive guide, we're going to talk about the science behind goal setting, and why this can truly transform your life and make this your best year ever, and I'm very, very excited. 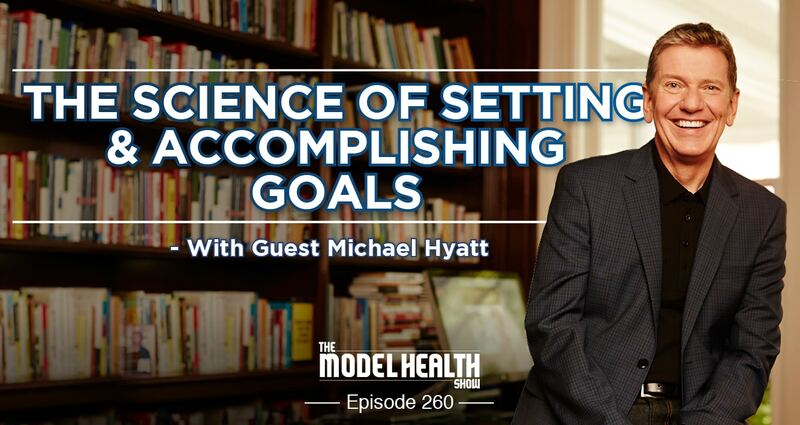 We have probably the greatest expert in the world right now in this topic, and somebody who just blew my mind because he actually dove in and dissected some of the science behind this to show us just how effective setting goals are. And not just setting goals, but the science of achieving goals as well. Before we get to our special guest, I want to give a shout-out to our show sponsor, Organifi. Now you probably know that I'm a huge fan of their green juice supplement. I think every single person should be on a green superfood blend, alright? But have you tried their red juice formula? Have you tried their red juice? Cold processed, number one. So it's actually retaining all of the nutrients that you would think is coming in a so-called multivitamin that actually is not there, especially in the form that they say it's there. This is a real concentrate of whole superfoods. One of them is remarkable. It's something I wrote about years ago, one of my very first articles I ever wrote, and this was looking at a study published in the 'Journal of Applied Physiology' showed that drinking beet juice boosts stamina up to 16% during exercise. Alright? Beet juice. This is one of the incredible superfoods that is concentrated in the red juice blend. It's part of the reason it's red, alright? So you've got the beet in there. Also, Acai. Everybody knows about Acai now, one of the highest Orac. So we're talking about the antioxidant density that's in this superfood. Orac value of 103,000. That means there's about ten times more antioxidants than you find in most kind of conventional fruits that you see out there, even if they're the healthiest ones in your grocery aisle. So this is operating at a whole other level and giving it that quality or category as being known as superfood. Also pomegranate is in there. Raspberry, blueberry, but they also have the medicinal mushrooms including cordyceps, which you should know I'm a huge fan of as well. This is clinically proven, there are multiple studies showing that cordyceps helps to reverse insulin resistance and also helps to increase oxygenation of your blood, and help to boost stamina. Again, another thing that boosts stamina. Along with the beet juice, we've got a really powerful combination for energy, not just for exercise, but for your energy in general. I've been having my red juice daily, and I absolutely love it, and really for me, I feel that it's helping to recover from an injury that I dealt with- that I suffered a little ago, which I'll talk more about in a future episode. But combining all of the nutrients that are in red juice with some MSM, and MSM, that's methylsulfonylmethane. It's a form of sulfur, and this combination, because many of the nutrients that are in the red juice are bio-potentiators and helps the body to absorb the MSM better, and so I really feel that it's helping with my recovery. So it's great for energy, it's great for helping literally to create new tissues in your body, this is just some good stuff guys. So make sure to pop over, check them out. Get the red juice blend- if you've already been on the green juice, the red juice, and it tastes really great. My kids love it. The red juice blend from Organifi, and of course organic ingredients. Alright? So they're doing everything the right way. Go to www.Organifi.com/model and you're going to get 20% off the red juice, the green juice blend, every product from Organifi. Exclusive for The Model Health Show, you get 20% off your entire purchase. Alright so head over there and check them out. And on that note, let's get to our iTunes review of the week. ITunes: Another five star review titled, 'My Mind is Blown,' by Bren. 'I have been a listener for awhile now, but the episode about the biology of belief has totally changed how I see my body and mind, and even how I view my life and my experience on this earth. Shawn Stevenson: Yes indeed, thank you so much for leaving that review for me over in iTunes. I truly do appreciate that immensely. And everybody, thank you for hopping over to iTunes and leaving those reviews. Please keep them coming. Our guest today is the incredible Michael Hyatt, and he's a 'New York Times,' 'Wall Street Journal,' and 'USA Today' bestselling author. He began his career at Word Publishing while he was a senior at Baylor University, and in thirty years since then, he's worked at nearly every facet of book publishing including being the former Chairman and CEO of Thomas Nelson Publishers, now a part of HarperCollins. He's also an expert in the field of social media. His blog, www.MichaelHyatt.com is ranked in Google as one of the top half percent of all blogs with more than one million page views a month. Recently 'Forbes Magazine' named him one of the top ten online marketing experts to follow, and one of the top fifty social media influencers. He's also the President and Founder of Platform University, an online membership community designed to give people the inspiration, coaching, and resources they need to get noticed in a noisy world. And he's back with the 'Lead to Win Podcast.' Alright? I already loved his podcast, but now he's just reformulated it, and it's out and brand new, the 'Lead to Win Podcast.' You want to check that out as well. I love learning from Michael. Now while he loves his work as well, it is not the most important thing in his life. That position belongs to his family. He's been married to his wife, Gail, for over 39 years. It might be even longer than that, I'll ask him. And they have five daughters- that's right, five daughters, three sons-in-laws, and eight grandchildren, and they live just outside of Nashville, Tennessee. And I'd like to welcome back to The Model Health Show, my friend Michael Hyatt. How are you doing today, Michael? Michael Hyatt: I am doing fantastic, Shawn. Thank you so much for having me on again. Shawn Stevenson: It's my pleasure. It's my pleasure, love talking to you, and like I said I absolutely love learning from you. Glad you're back retooling the podcast. And so is it 39 years you've been married? Michael Hyatt: It is, that's actually an accurate stat. It will be 40 this coming summer, but yeah 39 years. It's a long time. Shawn Stevenson: Yeah! Yeah! But married and happy, you know and this is one of the things that's kind of imbued in your work as well, is how much our relationships matter in our success, right? Michael Hyatt: They do. But especially the ones with our most significant people in our lives. Gail is my greatest cheerleader, my greatest support, my best critic- and I mean that sincerely. You know, she's the one that gives me the most constructive, most positive but powerful advice, and I trust her like nobody else. Michael Hyatt: So it's great to have a partner like that. Shawn Stevenson: Absolutely. When it works, it really works. So now, today we want to talk about goal setting. And your incredible new book- and I want everybody to- you need to get this book like yesterday, and I'm not kidding. This is the best book on goal setting that I've ever read, and I've read dozens that tinker on the idea, the concept- some focus on it more, but this is by far the very best book that I've ever read on the topic because you dive into the science and really speak to my man brain on that. Shawn Stevenson: But that's the thing that I want to ask you about first, is that there are so many books on the topic, right? So why did you feel that writing a book on goal setting was important for you to do? Michael Hyatt: Well it's interesting because goal setting has been something that's been part of my life since I was in college. If you look at 'Strength Finders,' my number one strength is Achiever, and so I just love checking things off, and especially goals. Over the years I've gotten a little more proficient at it every year, got a little bit better at it, and I think I've been able to accomplish some amazing things. Now I've had some profound failures which have only served as fodder for future growth, so that's a good thing too. Long story short, since we introduced that course in 2012, we've had 25,000 people go through the course. We'll add another 8,000 this coming year to the course. So we've had this enormous base for feedback, for research, for intelligence. And the thing, just to kind of get back to your question, that was all background, is I think so many goal setting systems are basically what works for that person writing the book. Michael Hyatt: And the thing that's different for this book is that I really tried to dive deep into the science, and that's one of the things I really respect about you, Shawn. When you wrote on sleep, it wasn't just what worked for you, but you went deep into the science, and I tried to do the same thing because I wanted to show not just what worked for me, but what the science says works for everybody. It's one thing to get results for me, it's another thing to get results for my students, and that's where I've been focused is on getting results for my students. So I think that's what sets the book apart. Shawn Stevenson: Oh yeah, definitely. You know, there's just so much theory out there, you know? Shawn Stevenson: And like you just said, a lot of times we do speak from our own experience which is great and wonderful that we have those experiences to share, and that will help a lot of people, but it won't help the greatest amount of people because we need to have more options. You know, same thing with sleep. I don't do all 21 of the things that I talk about in the book. I do the things that work for me, that fit into my life. Shawn Stevenson: I did test all of them, and I found a nice database of not only clinical studies but people who have achieved success with those things, but you have to do what's best for you. And so I'm curious, what inspired you to actually dig into the research on goal setting and kind of structure it this way personally? What inspired you to do this? I get it, your daughter mentioned this, business partner, but you personally? Why do you think that this was important and why did you structure it this way? Michael Hyatt: You know, it's really important for me to validate things, and it's got to be more than my experience. Michael Hyatt: And especially if I'm going to stand in front of a room full of people, or a workshop, or have an online course that reaches tens of thousands of people, I want to make darn sure that it works. If they're going to give me their hard earned money, I want to make sure that it works. And so much of the conventional wisdom around goal setting is just flat out wrong, and I'll give you a great case in point, is that a lot of people think- and this is taught in corporations, or let me just say it's not even taught, it's just assumed that you need to set goals that are kind of safe, that you can absolutely beat because that will build your confidence, and you'll be able to hit them. Well actually, that's a recipe for disaster. If you set goals that are too low, they won't engage you emotionally, they won't captivate your imagination, they won't necessitate the kind of innovation that's required to achieve big important goals. So the goal can't be too high, but it has to be high enough that it's in your discomfort zone, and all the research bares that out. So I mean that's just one thing among many that I just wanted to kind of debunk some of those common myths. Shawn Stevenson: Yeah. Yes, and we'll talk more about that. So just personally, I'm going to throw another question in here that just came up for me. Shawn Stevenson: Why do you feel it's important for each of us to even set goals in the first place? Michael Hyatt: Oh great question. Okay so most people- first of all, the people who listen to your show I know are exceptional. They wouldn't be listening to it if they weren't trying to better themselves. Michael Hyatt: But most people out there are drifting through life. They're like a bobber on the waves of the sea, just carried with the current. They don't have any intention, they don't realize that a great life- I mean great health, which I know you are committed to, that's not something that just happens. That's something that's caused. You have to take the initiative to make that happen. Same thing is true for a marriage. We were talking about my marriage to Gail of 39 years; that just didn't happen. I wasn't just lucky in love. The truth is we're polar opposites. We almost killed each other the first five years. And to create a great marriage, that takes intention and it takes goal setting. Same thing for a business. This year my business, Michael Hyatt Company, we were named to the Inc. 5000 fastest growing private companies in America, we were at about 1,250 I believe, and that just didn't happen either. That is all the power of goal setting. I'm 62 years old, I'm in the best shape of my life today, I lift more today, I have more endurance, I have better balance. That just didn't happen. That comes from goal setting. So if you want to create a life that you'll love, I don't know of a better way to do it than to set and work toward goals. Shawn Stevenson: Yes. Man, so powerful. So powerful, and I think so often we look past that, you know? We're so busy in our day-to-day that we don't realize that we can actually define- we can choose what we're going to accomplish. We can focus our attention, our energy, our resources, and actually achieving something great if we just take the time to set the direction and stop being a bobber in the waves of life. So thank you for sharing that. Shawn Stevenson: Now I think accomplishing any goal at a foundational level begins with belief. Shawn Stevenson: So let's talk about just how much belief matters in this equation. Michael Hyatt: And I'll just tell you this quick story. I used to have this dog named Nelson. I was the CEO of Thomas Nelson at the time, and I thought this would be kind of cute to name my dog after the company, so I named him Nelson. and we'd spend the next twenty or thirty minutes chasing him around the neighborhood trying to corral him back into the yard. So then we discovered invisible fence, and so we put the invisible fence in, and in- I don't know if you know how this works, but it's amazing because the dog wears a special collar, and every time he approaches the boundary of your yard where there's been a wire buried, he gets just a small vibration. barrier and it scared him enough that he wouldn't transgress the barrier even if I stood on the other side of the fence with a dog treat, or I had the grandkids with me, or whatever, the dog wouldn't budge. And here's why, because the fence had moved from sort of an objective reality to being something that was internal inside of Nelson's head. Even when we took off the collar, he still wouldn't budge. There was nothing restricting him, but he had this belief as a dog that it would stop him. And a lot of people are like that with their beliefs. They have these limiting beliefs that are holding them back and keeping them from making the progress that they'd like to make. It keeps them stuck. Shawn Stevenson: Yeah, in the book you actually talk about- and again this is diving into the science, there's something you mentioned called the Thomas Theorem, right? Shawn Stevenson: And you state how we tend to experience what we expect, right? So can you kind of dissect that a little bit for us? There was another sociologist by the name of Robert Merton who reflected on the Thomas Theorem about twenty years later, and he coined the term- and we've all heard this, self-fulfilling prophecy. Michael Hyatt: And then Karl Popper, who was a philosopher of science, called this the Oedipus Effect after the mythic Greek hero that fulfills this tragic prophecy. But here's how it works. Our expectations shape what we believe is possible. So- and in turn, these expectations and beliefs shape our perceptions, they shape our actions, and that means they also shape the outcomes, and that means they shape our reality. So we've got to be careful and examine our beliefs- and we've gotten very good about this in my family and around our company of challenging those limiting beliefs when they come out of their mouth. And the truth is, you could reframe that- and this is what I encouraged him to do, and say, 'Here's the truth, here's the liberating truth that should replace that limiting belief, and that is that you have more experience than the competition. And so it's all about what we believe that's going to shape the reality that we experience. Shawn Stevenson: Yeah, wow. So I really want everybody to take a second, and to get that imbued into your spirit, that if you don't have that sense of belief in your capacity or in your capability, you've already failed before you started. Shawn Stevenson: And I think that the first thing that we can start to cultivate- and we're going to talk more about this, some of these limiting beliefs, is to start to cultivate a belief and getting outside of your paradigm. So right now if your goal is to have the fitness level or the physical appearance that you want, you have to start to truly believe that you can have that thing. But there's these limiting beliefs behind the scenes we're going to get to that can stop us from that, but we have to cultivate the belief first so that we can start to actually move in that direction. And another thing you said in the book is that doubt is goal toxin. Alright? Doubt is goal toxin. Why do you say that? Michael Hyatt: It's because if you believe your dream is impossible, or just improbable, you won't take the necessary action to make it real. And again, the research on this is solid. I mean in other words, why bother? Either you won't even start or you won't give it your all. I was running in a half marathon probably a decade ago, and I came up on this guy- I mean you know how these are, I don't know if you've ever run one, but like 35,000 people. Right? Michael Hyatt: I loved that, but this was a guy that didn't doubt his ability at 80 years old to run a half marathon. And I caught up with him at the end of the race, he finished and he had run like twelve of those by that time, and it was just amazing. But people that doubt they can do that won't even try. When I was the CEO at Thomas Nelson we were running half marathons to raise money for charity, and at one time I had over 100 people from the company run the half marathon with me, and there was one woman who was seventy pounds overweight from what her ideal weight should be. And Shawn, in four months’ time she lost that weight. She lost seventy pounds, ran the race with us, and the awesome thing about it was it just didn't fuel her physical fitness, it fueled her mental fitness, it fueled her sales performance at work. Her sales went up like 40% that same year because she used it as leverage in the other areas of her life. But it all began by confronting the doubt, and that's what we have to do. Here's one little piece of science. Polls show that the percentage of people in their twenties who achieve their New Year’s resolutions is far greater than those over fifty. In fact, the Harris Poll found while eight in ten millennials set resolutions, almost seven in ten adults over 65 say setting resolutions is a waste of time. So what's going on here? Well after decades of setbacks and failures, many people doubt a better future is possible. For younger people, here's where a lack of experience actually is a benefit, but it all comes back to our belief system. Shawn Stevenson: Yeah, wow that's so powerful. And I saw some of the research obviously in your book as well regarding that, and how we can start to become a little bit weathered and jaded about the whole process when you don't succeed. Shawn Stevenson: And you start to actually reframe it in the book, which we're going to talk about in a moment as well. There's so much good stuff but I want to get back to the point of- because okay so we know that we have this potential, we want to do these great things, and we realize, 'You know what? I actually don't really believe that I can do it,' and we realize we have these limiting beliefs. You actually take people through the book to pinpoint and pull out what those things are, kind of find those weeds so we can actually pull them out. So what I want to talk about now is what are some of these limiting beliefs that actually hold us back? I want to go through the four of them that you put in the book. The first one is black and white thinking. Alright so let's talk about that. Michael Hyatt: Okay this is when we assume that we failed, and if we don't achieve perfection, then there's no use in trying. Reality is usually a sliding scale, though it's not a toggle switch. Michael Hyatt: And one of the things I learned from my mentor, Dan Sullivan, was the difference between the gap and the game, and here's how it works. When you're somebody who's out to accomplish great things, you know there's going to be a gap between where you are and what you want to achieve. Right? So that's the gap. That's great on the front end of goal setting, but once you cross the finish line- let's say you didn't make the time you hoped to achieve when you were running that race, or you didn't make the income or the revenue in your business that you hoped to achieve, or whatever it is, maybe you fell just a little bit short. Instead what Dan encourages people to do, and what I encourage you to do in the book is measure the game, to look backward. You know, when you're approaching the goal, look forward and measure the gap. But when you cross the finish line, look back and actually measure what you accomplished. Because again, it's not a black and white thing, it's more like a sliding scale, and if you can count the wins and focus on where you succeeded, that builds your confidence and gives you sort of the emotional mindset where you're willing to take on bigger goals instead of throwing the whole thing out the window. So that's kind of the first kind of thinking that can hurt us. Another one is personalize it. Shawn Stevenson: And for me- and I've seen this firsthand. You know, somebody set a goal to go for making maybe $50,000 a year to making $100,000 in six months, or whatever the case might be. And I'm paraphrasing this example, but they get $50,000 in six months, which was what they did in an entire year before that. Right? Shawn Stevenson: Do you see that as a failure? And here's what the magic part is, is that by you setting the goal and then you doing the things- the action steps necessary to get you to that $100,000 or whatever the goal was, it's going to take you so much further than you would have gone had you not set the goal in the first place, and start to think bigger than you were thinking, and just going around operating on autopilot maybe a little bit better, or maybe even going backwards. Be mindful of that because it does actually happen. So let's jump into the next one, and this one- so you said we've got black and white thinking, and the next one you said was personalize it. So what is that? Michael Hyatt: Yeah that's when we blame ourselves for random negative occurrences. I mean it could be anything from something that happens in our neighborhood to something that happens at work. You know, maybe for example you're in a company where the product division created a sub-standard product, and you were in the sales division, and you didn't get the sales results, and so you blame yourself. You personalize it and make it all about you, and usually life is more complex than that. There's usually a lot of factors that lead to failure, or lead to a breakdown, and we don't have to own all of them. We certainly have to own the ones that are ours, but personalizing is when we're like hyper-responsible, and we over-function, and take on more responsibility or own it more than we should. Shawn Stevenson: That's interesting. And with personalizing, this can come in the context- you know if you're setting a goal for- we'll just say your health and fitness, getting in shape, and then something happens with a significant other, or maybe your mother, something like that, maybe the car breaks down. Now- and I love that you mentioned that there is some responsibility we need to take, and I find that taking responsibility as much as we can in our lives is the greatest kind of empowerment that we can have, and the things that we can adjust. Shawn Stevenson: But if you get caught up in the fact of like, 'This thing happened, and it's just- it's on me,' then you're not going to continue to take action. It just sounds crazy, and I know people are like, 'I don't do that.' But many people do that all the time. They blame themselves in some weird way. Michael Hyatt: Well and you hear people say things like in the health and fitness area, say things like, 'Well I would love to lose weight but I'm just big boned.' You know, you hear that. Michael Hyatt: Or you hear something else like, 'I guess I'm just not meant to be fit. I guess I was just made to be a couch potato,' or whatever. But that's personalizing something that is really at the level of belief, and at the level of mindset that has nothing to do with objective reality. Shawn Stevenson: What's the number three? So we've got four of these, so what's the third one? Michael Hyatt: Okay so the number- and by the way, the first three of these come from Jeremy Dean's book 'Making Habits, Breaking Habits.' I've got a fourth one that I'll add here in a minute. But catastrophizing is when we assume the worst even with little evidence. But it's that kind of worst case scenario, catastrophic thinking that immediately goes on the dial from one to ten, or maybe even eleven, and it just doesn't serve us, and it's usually wrong. Shawn, recently- I journal every day, and I've been doing this for about seven years now. And so every day I look back on the entries that I made in previous years on that same day, and oftentimes I'd be wrestling with some problem at work or at home. But the thing I realize is this, I have a 100% success record when it comes to overcoming obstacles. And you know what? You do too. Michael Hyatt: And everybody that's in your studio right now does too. So far we've been 100% successful in overcoming whatever we faced. And we may be in the middle of something right now, and it may be easy to catastrophize it and think that we're not going to get out this time, that this is the time that's going to finally undo us. But all the evidence, if you look back over your life, would suggest that you're going to get through this. You're going to make it to the other side. The most important thing you can do is just stay in the race and not quit. Shawn Stevenson: Oh man, I love that so much. Love that. So this one- again this is like- it's all bad, bad stuff is going to happen. You know what? When you set a goal, things are going to come up. But when you make it like it's impossible because everything's going to break down, then again you're setting yourself up for failure and you're not going to take the action step necessary because this crazy limiting belief that all these bad things are going to happen is preventing you from setting the goal and taking action. Because I promise you- I promise- well I can't promise 100% but the world is probably not going to end. It's like somebody was like- you know it's 1999, they're like doing their goals, 'Ah it's Y2K. It's Y2K. The world is going to end anyways so I'm not going to set goals. You know like we have these crazy things that all these bad negative things are going to happen, and again I'm being real, I've seen it firsthand, things are going to happen. You know, maybe things that are not the best. Shawn Stevenson: But if you set the goal and you continue to take action steps forward, because a lot of things that happen, they're not happening to us, they're happening for us to develop the skills necessary to get to the goal that we actually have the capacity to get to. So thank you for sharing that. So those were the first three, and this- the last one, I love this. This is the one that I've seen more than any other. So what's that? Michael Hyatt: Yeah it's universalizing. Michael Hyatt: It's when we take a bad experience and we assume it's true across the board. And so what that did for him was he stopped dating, you know? He just said, 'What's the point?' Because he'd universalized that isolated experience. Today he's happily married because he shifted that limiting belief to a liberating truth that really examined sort of that universalizing thing, and took it apart so it could empower him to move forward in relationships. Shawn Stevenson: I love that. That's the exact example that I was thinking of when I first heard this, is that maybe- and this is for everybody listening. Maybe you want to have a healthy, loving relationship that you deserve- that you feel you deserve kind of consciously, but you had a bad experience with say a guy who cheated on you. And so now the belief becomes- because of universalizing, all men are dogs, right? Shawn Stevenson: All men are dogs. And what happens then is you start to replicate that. All you see is a continuation of the same kind of situation showing up when you put yourself into one. And number one, this goes back to you get what you expect. You have this selffulfilling prophecy. If all men are dogs, how are you going to find a cat, you know? And the reality is- I don't know if that even makes sense, but the reality is you get what you expect, and also you get what you believe you're worth. Right? Shawn Stevenson: And so if you believe that all men are dogs and yet you want a dog, then you feel like you're worth a dog. You know? And again, universalizing. And then take this in the concept of maybe you want to improve your life financially but you're carrying around a lot of disempowering beliefs about money. Right? Shawn Stevenson: Because you've got all these- usually it's the rich evil villain, right? Even in the movies it's the rich evil villain, or maybe the one rich person in your family. If one person has money, if you kind of grew up in poverty, it's like the Scrooge McDuck uncle, right? And when we can start to- again identify that crazy belief we're carrying around and start to pay attention to other examples. You know, wealthy people who are incredibly altruistic and giving. And these are a lot of the people that are in my life, you know? That changes your perception of what that can even look like. And last thing, you want to get your health and body into a place that you're just excited about, but you believe that being healthy is too time-consuming, and you universalize all things to do with that. And so in your mind, being healthy is just too hard, so why try? You know, so again we're looking at these limiting beliefs, and again Michael Hyatt, just at an expert- just mind-blowing level lays this stuff out in the book for us to address these things, and to get in there, look at these beliefs- the roots so that we can pull them out. So I want to shift gears now, and I want to talk about what's the source, the actual source of a lot of the limiting beliefs that we bring up in our own consciousness. I just mentioned one, which is like family influence. So let's talk about the sources of these limiting beliefs. Michael Hyatt: Well just to elaborate on what you said about family, certainly we grow up with a lot of beliefs that we assume are reality. And I grew up in a lower middle class home where we always struggled financially, and I just kind of thought that's how it was, that making money is really hard, that I'm probably going to be in debt for the rest of my life. You know, all these things were a source for me. Sometimes it could be a personal setback, you know? It can be something that happens to us, like we may get injured and then we develop a set of beliefs about what we can do or what's possible. Not so much. I didn't let that limit me at all. I still run to this day and have zero problem with it. But I think a big one that we've got to watch for now especially in the last few years, is the news media. Michael Hyatt: Because there's this crazy negativity bias, and once you understand the psychology of this, think about this. The news business relies on advertising revenue. So the game is to get as many eyeballs on the show as possible, right? Well one simple way to do that is to scare people because this is part of our evolutionary history is that when you're scared, you can't take your eyes off the threat. Michael Hyatt: And so when everything is breaking news, a news bulletin, something big and scary, the news media has figured out that if they can do that, they can keep you glued to your television set. The problem is that most of the stuff that's happening isn't what Dr. Steven Covey calls your realm or your area of concern, your circle of concern. It's not in your circle of influence. So all that big scary stuff that's happening, like as we're recording this, a couple days ago North Korea sent another big missile, and everybody's talking about how now they've got missiles that could reach the US. Shawn, I don't know about you, but there's not much I can do about that. I can worry about it, I can make my life miserable, I could lose a lot of sleep, I could spend a lot of unproductive time, and I could develop a lot of beliefs about that, or I can just say, 'That's not in my circle of concern, not my circle of influence, and I'm going to focus on what I can change. Social media is another one. You know the research shows that people that spend a lot of time on Facebook feel pretty crummy about their lives. Right? And yet we're glued to Facebook, and Facebook has developed the algorithms and the science to keep you glued to Facebook. They know what to serve up into your feed to keep you glued to it. And yet- and I think there are some wonderful benefits of social media. I mean I where am I am today in large part because of the social media, and because of the Internet, and all that, but we've got to be careful about our dosage and we've got to be careful about what we begin to believe as a result of what we see. If you just go to Facebook, it'd be very easy for you to come to the conclusion that everybody is living a charmed, amazing life, they've got a hot spouse, they've got incredible kids, they've got a wonderful job. And that's where this negativity bias that happens in the news media and in social media can implant these beliefs in us that will not serve us. Shawn Stevenson: Wow. Wow, that's a tough pill to swallow because this is our world today. Shawn Stevenson: And our ancestors didn't have to deal with this. It's like a whole new ballgame when it comes to implanting these limiting beliefs and this sense of comparison. And I love the statement that is when you compare yourself, you negate yourself. Michael Hyatt: I love that. Shawn Stevenson: And us carving out our own spot in life, which again I believe that we're here to do, that life is- I think it's like a one in four hundred million chance that you were born. You know, like you are already a miracle, you know? And this is your opportunity, life is working to express itself through you, you know? And to think that we're not good enough or that we're lacking, we're missing all these different things because we see what somebody else is doing, it's a sad state of affairs, but consciousness and awareness trumps everything. So again, bringing these things up to the forefront and talking about it through the sources of our limiting beliefs is really valuable, so thank you for sharing that. And also again, I want to reiterate a lot of our beliefs are structured into our minds when we're kids as well. And next up I want to talk about, of course, now that we've looked at the limiting beliefs, what are some real valuable ways that we can upgrade these beliefs? And so we're going to do that right after this quick break. Sit tight, we'll be right back. So when this is getting released, you want to get the pre-order copy right now to help to crush your year. And also, you know if this is coming out a little bit after that, go get the book like yesterday. It's really one of my favorite books. It jumped right to the top of the pile. So we were talking about limiting beliefs, and looking at what some of those limiting beliefs are, where did they originate? Now I want to talk about some ways that folks can start to actually upgrade their beliefs. Michael Hyatt: Great. Okay so the first thing you've got to do is you've got to trade your frame. So this is almost like taking glasses off that have caused you to see the world with a certain tint, and begin to see them in a new way. I remember a few years ago, I had my lenses in my eyes actually replaced. I'd developed some early cataracts, and so what I didn't realize, they did one eye at a time just for risk management purposes. They did one eye and then the next two weeks later they did the other eye. Oh my gosh, so the first eye gets done, all of a sudden it's like the world is in full color. It was so washed out before because my lenses were so clouded that I was really seeing a distorted view of the world, but I could compare it because one eye was fixed and one eye wasn't fixed. The eye that was fixed, I saw everything with enormous clarity; beautiful, vibrant colors. The eye that wasn't fixed yet, it was kind of this yellow cast to everything. So that's what you've got to do to your beliefs, is you've got to replace the lens so to speak and look at the world in a different way. And in my book, 'Your Best Year Ever,' I recommend a six step process for doing that, but here are just a couple of those steps. So the awareness thing, recognize your limiting belief. Is that empowering me? No! That's holding me back. It's holding me back from creating a great company, from being able to really help people, from being able to make the kind of money that I can support my family, and give, and all those things, so it's not serving me. So that's the second question to ask yourself, is just to review the belief. Maybe it's your age. Do you think you're too old or you think you're too young? And it's- I tell you what, I see this all the time because again, I'm in my early sixties. I see guys that are in their sixties, and you probably do too, that are just like- they've hung it up. They're phoning it in, they're nearing retirement, and they're slowing down. I think that's crazy. I think- I feel like I'm in the best shape of my life, I've got the most to contribute in my life, and oh by the way, I think I've probably got another 25 to 30 years at least and I'm not just going to sit around for 25 to 30 years and not make a contribution. So you've got to ask yourself, review the belief, is it empowering you? And then the third thing I would say is either reject the belief outright or completely reframe it. And by reframing it, I mean kind of twisting it around to your advantage. Like I suggested with my friend who had lost his job and felt like he was too old, well what's the benefit of age? Or what's the benefit of youth? Or what's the benefit of anything? Michael Hyatt: 'What's the gift in this?' And usually even when it's bad things that happen, like when I mentioned I broke my ankle, what was the gift in that? It was an enormous gift. I'll tell you what one of the biggest ones was, that happened in 2004, that's when I started blogging for the first time. Since that time I've built an entire business that now supports thirty full-time people, eight figure business that all started because I broke my ankle and had the time to start blogging. Shawn Stevenson: Man, I love that so much. And it's just- like you just said, the word for us to remember for today is reframing. You know, so reframing these limiting beliefs. 'Now that I've been through these negative things, I now have standards and I realize that I have this experience, so now I can really get to the good stuff.' Right? Again it's just as simple as reframing. So wow, thank you so much for sharing that. Well the liberating truth might look something like this. I'm not talking about creating an equally false narrative on the other side. No, no, no, 'All men are great.' No, some men are predators, but not all men are. And I'll bet there are some really amazing people out there that have power that don't abuse it. So it's just again recalibrating to what reality really is, not what we might believe that it is. Shawn Stevenson: So that gets back to like universalizing and making everything into a catastrophe, everything's breaking down as well. Shawn Stevenson: Wow I love that, and continuing to have that balance and awareness. So this is another thing you talked about in the book that just like- I was not expecting to see this, and it's because we hear a lot of people say things like, 'Live without regrets.' You know #NoRegrets. But you have a totally different view on regrets that was really refreshing and powerful, so let's talk about that. Michael Hyatt: Yeah so the truth is you're not alone, Shawn. Nobody likes regret, but let's go ahead and reframe that too. What if regret were really a feature, not a bug, if it was something that benefitted us, and that's exactly what the research shows. University of Michigan psychology professor, Janet Landman, identifies several benefits of regret. So here are three of them. Instruction. Regret is a form of instruction, right? Reflected on our missteps is critical to avoiding those missteps in the future. I explained how that worked in my own business failure. Secondly, motivation to change. Landman says, and I'm quoting, 'Regret may not only tell us that something is wrong, but it can also move us to do something about it.' Sometimes when we have something that we regret, it forces change. I ended up getting into therapy about that and it was one of the best things I ever did to invest in my life. I cannot recommend therapy more highly, but it was because of a regret that turned into an opportunity. Third thing that Janet Landman says is integrity. Regret can work in us like a moral compass, signaling us when we've veered off the path. And all of it points to two researchers from the University of Illinois, they call this the opportunity principle, and the idea is this. The studied people's most common regrets, setbacks, and failures in education, career, romance, a whole bunch of different fields, and then they mapped out a three stage process of action, outcome, and recall. And it's that final stage, the recall, where things really get interesting, and here's what they found, and I'm quoting from the study. And here's why, because we care, that's the same emotional driver that enables us to correct it and to fix it. If we don't have the regret we don't care enough to correct it. But when we have that regret, that becomes sort of the fuel that enables us to find an opportunity, to take corrective action, and actually use it as a springboard to a better future. Shawn Stevenson: Wow, that's powerful. Powerful. And immediately reading that, I started to kind of go in and dig around and look at some regrets, you know? And to reframe them. Man, that was such a good implement in the book. Shawn Stevenson: Again, I wasn't expecting that to be there, you know? But this is one of the things that holds us back from setting the audacious goals that are possible for us, is these regrets that we've had. So another thing that you talk about, and that's very significant that's getting a lot of attention today, is the importance of gratitude. Now I think a lot of people look past this because we don't really realize just how much it can actually matter. And I'd love to talk about how gratitude actually plays into accomplishing our goals. Michael Hyatt: Yeah so there's this kind of myth that's out there that says you've got to be careful about being too grateful. It sometimes shows up for employers, don't be too grateful and extending your gratitude to your people because they'll just get complacent. Right? Or if you're grateful yourself, you might get complacent in pursuing your goals, that gratitude leads to contentment, and contentment fights against goal setting. There were a couple researchers, Robert Emmons and Anjali Mishra who turned that whole thing on its head. And so they compared grateful and non-grateful goal striving. They had a big study and they had the participants keep a gratitude journal along with a list of goals that they hoped to reach over a two month period. So they checked back ten weeks later after they initiated the study. They found that the grateful participants were significantly closer than the others to achieving their goals, and actually gratitude helps us to achieve our goals. You're not going to get more of what you don't want- or excuse me, you're not going to get more of what you want until you're thankful for what you've got, and that's where it starts, to be thankful and to do our goal planning out of a sense of abundance. That's what creates possibilities, and all the right feelings and emotions that enable us to achieve even bigger, better goals. Shawn Stevenson: Oh, I love it. So you talk about in the book, the first way that gratitude helps us is that it makes us resilient, alright? It makes us resilient, and that's what keeps us hopeful. And then another thing that you mention is that gratitude reminds us that we have agency. Can you talk about what you mean by that? Michael Hyatt: Yeah so when I talk about agency, it means you've got power to affect the outcomes in your life. So again, it's the opposite of drifting. It's the opposite of thinking that we have no control over our lives, that we're just being pushed around by these invisible forces. When we're grateful, it's just a reminder to us that there's things that we've accomplished, things that we've done that actually were the result of our agency. And certainly we can acknowledge that other people helped us, that there were outside resources that came to bear, but it's just a reminder that we've got agency in this process, and gratitude helps us reach that. Shawn Stevenson: Love it. Love it. Alright I've got two more quick things I want to ask you about. So there's been debates about this, we've got new technology now, everybody's not just putting pen to paper, but does it matter if we just have some goals just kind of rattling around in our minds? Or is it actually best for us to physically write them down or type them out? Michael Hyatt: Well here's what's funny, the truth is most people don't write them down. For years I conducted this sort of informal study whenever I would teach on goal setting, I'd go in and I'd usually be teaching high level corporate leaders, or CEOs, or business owners. And so I would start by saying this, I would say, 'How many of you believe in the power of setting goals?' I mean every hand goes up. Michael Hyatt: Who's not going to say they believe in that, right? And then I said, 'How many of you have goals for this year?' Almost every hand would go up. I said, 'Okay third question. How many of you, be honest, have a set of written goals for this year?' And I tracked this over about a five year period, usually 3% to 5% of the audience's hands would go up. Every other hand would go down. So very few people have written goals, yet professor Gail Matthews of Dominican University California recruited 267 entrepreneurs, executives, artists, educators, people from all walks of life, tracked them over several weeks, found among other things that the mere act- get this, Shawn. The mere act of writing your goals down boosted achievement by 42%. 42%. Who wouldn't want to give themself that advantage? And I think the reason why is that by writing something down, it's like the first action in the creative process. First of all, it gives us clarity. There's something about having to write something down that forces clarity. I heard this years ago, I'm not sure who to attribute it to, but thoughts disentangle themselves passing over the lips and through pencil tips. So there's something about writing it down that forces you to get clarity, and that clarity becomes an accelerant in terms of moving you towards your goal. So writing down is a simple, easy strategy that anybody can employ, that gives you a 42% advantage in terms of achieving your goals. Shawn Stevenson: Oh man, this is so good. Chances are, a lot of us didn't know this fact, alright? But we're talking over 40% greater incidents of you actually achieving your goal if you just write it down. So today- today or maybe tomorrow, maybe tomorrow morning you set aside some time, but do this like yesterday, everybody. Please write down your goals. You're eliciting a whole other level of potentiality in accomplishing those goals just by writing them down. It's really, really remarkable. So last thing I want to ask you about is this concept- and you even have some images in the book that lay this out, so let's talk about the comfort zone, discomfort zone, and delusional zone, alright? What's going on with these three different things in the context of setting and achieving goals? Michael Hyatt: This is critically important to achieving your goals. And by the way, I do go through that entire process in the book, it's one entire section, on how to write your goals in the proper format to maximize the potential for achieving those goals. So there's several different components, seven attributes of a really well-crafted goal that will ensure your chances of actually hitting it. But when I'm talking about these zones- and this comes back to something I talk about, the importance of making your goal not realistic, right? So that's how we mostly have been taught that, is that we need to set goals that are realistic. Right? Well not so much. I say you need to have goals that are risky. So the comfort zone, we all know what that is. You know? That's the area where you feel confident, you feel like you've got the resources necessary to hit the goal, it's not going to really require much out of you. You can just kind of like fall off a log and hit it. But that's not what the research shows. People that set goals in the comfort zone forget them. They're just not compelling enough to make us- to engage us, to engage our imagination, to force innovation, or to keep us focused on actually achieving them. Nothing good happens in the comfort zone. If all you want is the life you've got now, if you don't yearn for more, great. Set your goals in the comfort zone. You know, that's fine. But for the rest of us that want something more, a better marriage, better health, bigger business, more contribution to the world, and more impact in the world, you want more and it's imperative that you set your goals in zone two, which is the discomfort zone. This is where all the important stuff in life happens. This is where you achieve the breakthroughs. This is where you see real results. This is where you achieve things that you're proud of, is in the discomfort zone. But here's the problem, it's not called the discomfort zone for no good reason. It's because we feel uncomfortable when we're in that zone. And particularly we feel fear, uncertainty, and doubt. Three negative emotions that I argue in the book, 'Your Best Year Ever' are positive indicators that we set our goal exactly in the right place. Because it's natural, if there's some risk, you're going to feel a little fear. It's natural if there's some risk, you're going to feel some uncertainty. You don't know the path because you've never done it before. And you're going to feel some self-doubt about whether you've even got the capacity or the capability to achieve it. That's exactly where you want the goal, if you want to actually achieve it, and keep focused on it so you do achieve it. Then there's zone three. This is the delusional zone. This is where you've dialed it up so high that there's no possibility that you could achieve it. The discomfort zone is the balance, the delusional zone is just as destructive as the comfort zone because if people attempt to achieve something that's delusional, they fail and they throw goal setting out the window. Example. I had a friend who decided after he heard I taught on goal setting, he said, 'You know what? I totally believe that. This year I'm going to 10x my income.' I said, 'Really? You're going to 10x it?' And he was making about $75,000 a year. Well he hadn't identified any steps, he hadn't thought through the strategy, he really wasn't even clear why. Well guess what? He made almost no improvement on his income, and now all of a sudden he's disillusioned. His wife's disillusioned. He said, 'That whole goal setting thing doesn't work.' Let me tell you something, the problem was not goal setting, the problem was he was delusional. He set the goal in the wrong place. So what I like to do is to kind of go to the delusional zone, and then dial it back a few clicks where it's in the discomfort zone. That's where you're going to have your greatest possibility of success. Shawn Stevenson: Wow, I love it, love it, love it. When I got to this section of the book, of course I thought about somebody's- they've got a thing coming up, maybe it's a holiday, event with the family or whatever, and it's four weeks away, and they need to lose fifty pounds. And that's the delusional zone, okay? We can make some incredible progress in four weeks, or even in a week you can really see some significant changes with your body, however we need to be smart. And this is the important part, it's not to revert all the way back to the comfort zone, we want to stretch ourselves. And so when you're setting your goals, if you feel like you can readily attain it, it's not big enough. Right? But if you are, you know, right now you're fifty years and you're like, 'You know what? I'm going to be an NFL running back.' Like obviously, like we're kind of just a little bit off. But can you get a coaching job? That's a possibility. You know maybe not in NFL, you start coaching high school football, you know? Like start there and they can build up and you can actually find yourself closer to your vision that you could imagine. So just great stuff, Michael. I would love if you can let everybody know, number one, where they can connect with you online, and of course where they can find 'Your Best Year Ever,' the brand new book. www.MichaelHyatt.com. Everything related to my blog, to my podcast, all that stuff is there. Then the best place to connect with the book is at www.YourBestYearEverBook.com. And for people that buy the book, we've got some amazing bonuses that will be really helpful in terms of them applying. They can buy the book anywhere; Amazon, Barnes and Noble, online or offline wherever, and all they've got to do is submit the receipt to us, and you can do that all online, and we'll get you the bonuses, and you'll take off from there. Shawn Stevenson: Perfect. Michael, you are just an absolute superstar and I'm so grateful to have you on the show and to have this conversation. Shawn Stevenson: And thank you so much for sharing your gift, and for- man, you're just so inspiring because like I really do feel- and hopefully people pop over to YouTube as well if you listen to the audio podcast. You've got so much vitality and energy, I know that you're going to be crushing it for several decades to come, you know where a lot of people like you said are phoning it in. Shawn Stevenson: And in many ways I know you feel like you're just getting started, and it's so exciting for me to be right there with you. So thank you so much, Michael. I appreciate you. Michael Hyatt: Thanks, Shawn. Appreciate you. Shawn Stevenson: Everybody, thank you so much for tuning into the show today. I hope you got a lot of value out of this. Again, if I can't stress it enough, make sure to go and check out 'Your Best Year Ever.' Best book on goal setting by far. And a couple key takeaways from today with Michael is that I want you to remember this, you have 100% success rate in overcoming your obstacles. You are still here. You're still here, alright? You've made it 100%. Why would you think you cannot make it to the next level? Why would you think that the next thing is going to take you out? We've got to change our mindset and realize just how powerful we actually are. That's the foundation of this. And then a couple of steps today- and we went through so much. This might be one to go back and listen to again, but the power of gratitude. No, this is real. This is real and there's solid science behind this. You can actually achieve your goals at a higher level by cultivating gratitude. Alright? And gratitude changes your perspective. It reminds you of how fortunate you are. It reminds you of how much you've already accomplished. It reminds you of what you're capable of. Alright? And it also reminds you- because there's going to be a gap, there's going to be a distance between where you are and where you want to be with your goals, but having gratitude reminds you of where you were before and what you've already achieved. And you know that gap starts to get smaller because you know what you're capable of, alright? So cultivating that and remembering that you have agency. You have the power, you have the capacity to make change in your life. It is imbued in you, and gratitude again helps to really bring that out. And there's, again, science behind it now that shows that having a gratitude practice will better help you to achieve your goals. Last thing I want to highlight is writing down your goals. Do this like now, alright? Do this right away. 42% increase in achievement of your goal by simply writing it down. Don't just have the goals rattling around in your mind like some Yahtzee dice, alright? Write the goals down so you can execute. This is going to give you a new level of leverage to achieving what's possible for you. And again, it's all in 'Your Best Year Ever,' so head over, check it out and definitely follow Michael Hyatt. He's one of the greats out here doing it. I appreciate you immensely. Alright let's dominate, alright? This is your time, this is your year, it's time to execute, and it starts with following through on these steps. Alright take care, have an amazing day, and I'll talk with you soon.